Last week, I went on a spree at Magic Shop in Far East Plaza (#01-38) . Magic Shop is a brand that Originated in Taiwan (since 2006). There are currently 8 outlets in Taiwan, and 1 in Singapore that opened just last year. 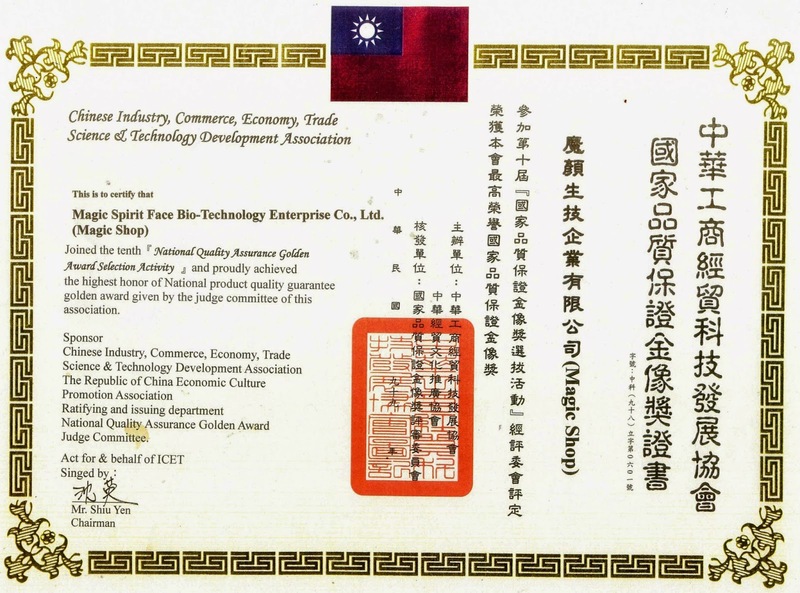 Magic Shop has the Gold Award for product quality. I love the friendly service there where staff are very knowledgeable about the products and can help explain how best to use it. Magic Shop is available online in Singapore but if you prefer to test out the products before purchasing, then do head to their store at Far East Plaza. Most of the product range have testers so you can try it out for yourself. I love browsing through each shelf in the store because they have such a wide range of products... skincare, make up, hair care and nails too! Here's my haul from Magic Shop! The first item I want to show you is one of their best sellers. It is the Protective Makeup Base $59.90. This product is not just a make up base, it actually helps to lock water into your skin after you apply your daily nutrients. As you can see from the picture above, after you apply your regular moisturiser, there is usually a layer on your skin which doesn't get absorbed. This protective make up base immediately allows the skin to soak in all the moisture. I love the soft and supple feeling my skin has after using this. And it keeps my skin matte, and make up stays the entire day. Another item that got my interest is the UV Expert Serums. There are 4 kinds - transparent white, skin, purple and green. Each one helps with any colour correction you need. For instance, if you have a more yellow complexion, then the purple serum can be used under your make up (or you can mix it with your foundation and apply together. I got the UV Expert Serum SPF30 in Transarent White and in Skin. Each bottle is $39.90. I love that at this price, I don't just get a serum but I can skip liquid foundation/ BB cream. Especially when the weather is humid and warm, I prefer a light and natural coverage on my skin. The combi I'm using (transparent white + skin) gives me a brighter complexion. It doesn't feel greasy or heavy on my skin and I think the key word here is breathable! Apart from coverage of imperfections, this serum is an excellent shield asit also protects my skin from UVA & UVB damage. This will prevent premature aging and skin cancer. By the way, the sponge I'm using to apply all this is also from Magic Shop. It's called the Bottle Gourd Blending Sponge $5.90 and it is very useful for application of liquid foundations or BB/CC Creams. It makes spreading the product over my face and blending it in so easy. I use the fatter round side of this sponge to cover bigger areas quickly, and the narrow tip for getting into creases and corners like around the nose, lips and eyes. It always gives such a smooth finish. For fuller coverage, I use a loose powder over the UV Serum. Magic Shop has 3 shades for this, and I'm using the darkest one- Pearl Loose Powder (Wheat) $42.90. This powder is very fine and airy. Pat it on to get a sheer pearl glow radiant complexion. It makes my face look fresh for much longer because it seals everything in and extends the life of my make up. Now that I hardly wear any false eyelashes anymore, I'm totally reliant on intensely black eyeliners and waterproof mascaras to open up my peepers. Magic Shop's Waterproof Eyeliner (Black) $29.90 is amazinggggg! The staying power is one of the best I've seen. This eyeliner pencil draws very smoothly and the black is very intense. Just stay still to avoid smudging... and once it sets (takes about 10 seconds), it's smudge proof and water proof all day, no problem! The Waterproof Fiber Mascara (Black) $29.90 is both smudge and tear proof. Even though it's a fiber mascara, it gives me clump-free lashes. I would say that this mascara makes lashes longer and more defined. As you can see, the left side of the picture, my eye has no mascara or eyeliner. The right side has both the Waterproof Fiber Mascara and Waterproof Eyeliner. Look at the intensity of the black! It really defines and opens up the eye. Of course, at the end of the day, with waterproof mascara and eyeliner... you won't get away with just washing your face. 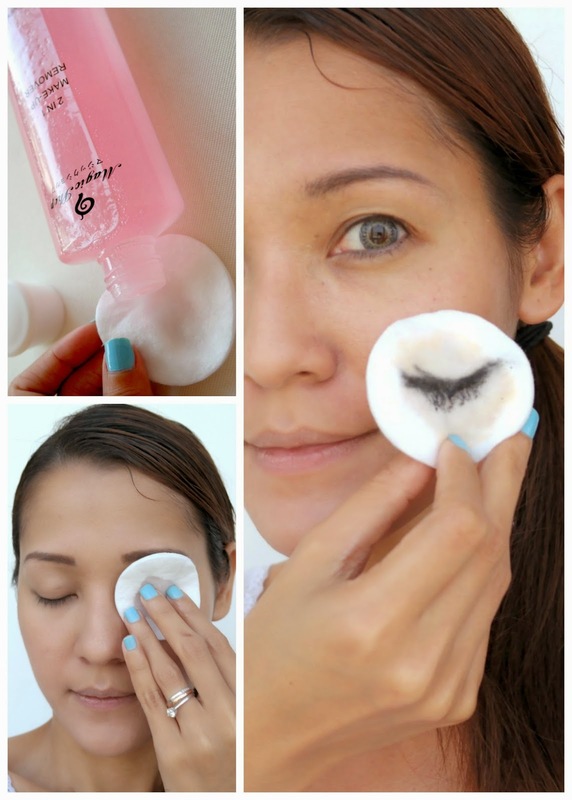 You need a make up remover which can thoroughly (but gently!) remove all traces of make up. This 2in1 Make Up Remover $39.90 (200ml bottle) does the job perfectly. Remember to shake the bottle before using. Then just dampen a cotton pad with some remover and wipe make up off your face with gentle strokes. For the eye area, I hold a cotton pad over each eye for about 10 seconds and the gently wipe off the make up. 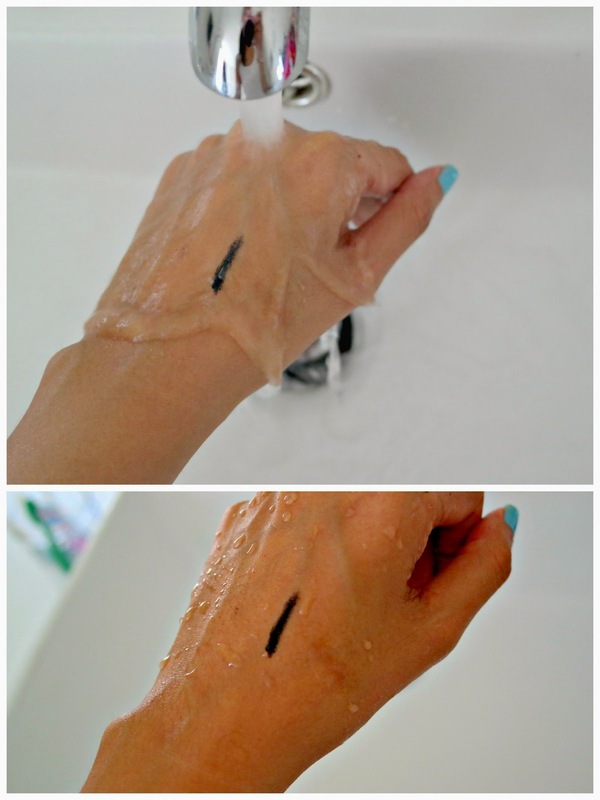 This remover has no alcohol, it's great even for sensitive skin. I love the cherry blossom smell too. One more nifty little product that I love and always carry in my handbag now is their Lip Stainer $29.90 . I never used to be a fan of lip stains in the past because I always felt they turn my lips orangey... looks like I ate something which stained my lips accidentally and some were drying too. In fact, I'm notorious for not wearing anything on my lips at all even though my face is made up and this made me look like death sometimes haha (my lips are naturally just pale!) But this Lip Stainer from Magic Shop turns my lips a flush natural pink! Share their fb page/posts to stand to win their products! Quote "HOLLYJEAN" and like their facebook to enjoy a 10% off storewide, ends 31 May 2014!